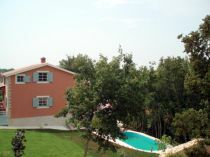 We are pleased to offer this very well presented three bedroomed, all ensuite, air conditioned, newly built part stone house with sea views and pretty pool in the quiet hamlet of Mofardini. The hamlet has just a few stone houses in it, most of which were sold by us, and is popular for rentals. The house has three luxury bathrooms, two with proper baths and underfloor electric heating and a fully fitted top of the range kitchen. Every room has SAT TV and phone(internet)connections. Floors are either solid oak parquet or quality Italian ceramics. 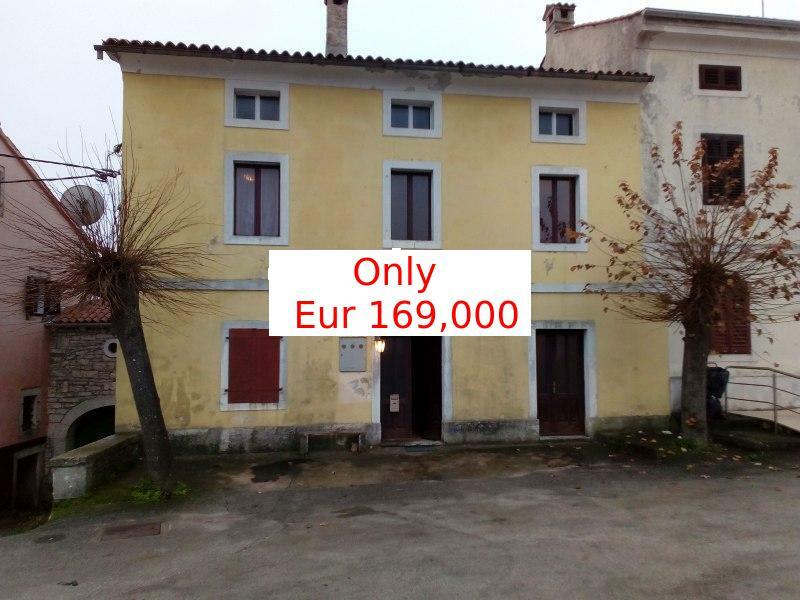 A variety of shops and bars are available 10mins away in the old walled town of Sv.Lovrec. 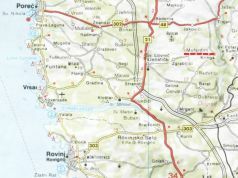 Rovinj is less than 20mins away, as are the excellent fish restaurants of Limski Fjord, with its mussel and oyster beds. 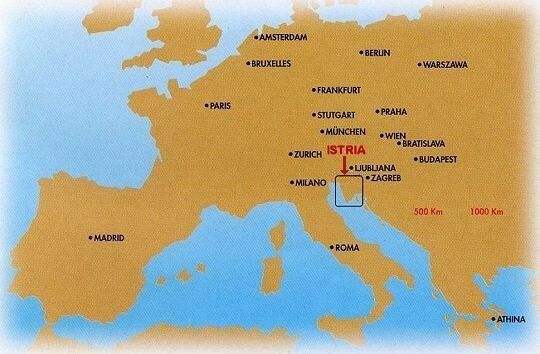 It is only a short drive to the fast road joining Trieste (90mins) and Pula (45mins), both with Ryanair connections. Entrance Hall: Tiled Floor with boiler room beneath the stairs. Dining Room / Kitchen: (6m x 3.5m)Open plan with traditional stone fireplace. 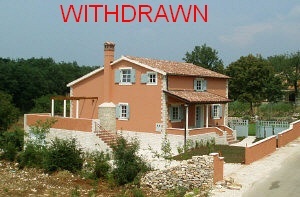 Terracotta tiled floor, Granite worktops, Porcelain double sink, Bosch built-in appliances. Terrace: (8.5m x 3.5m) Tiled. Sea view and uninterrupted views to green countryside. 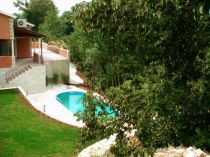 Steps leading down to the landscaped garden a pool. Bedroom 3 (4m x 3m) Parquet floor and double doors to the terrace. 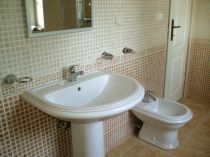 En-suite Shower Room Fully tiled, with WHB, shower, WC and bidet, also accessible from the Entrance Hall for guest use. Bedroom 1: (4m x 3.8m) Parquet floor, Large Walk-in Wardrobe. Bedroom 2: (4m x 3.2m) Parquet floor, Large Walk-in Wardrobe. Garage beneath Terrace with utility room behind. Fully landscaped gardens with turfed lawns, acacia, cypresses, lavendar, rosemary, rambling roses, wisteria, etc. UTILITIES: Mains electricity, water and telephone. Private drainage system. Air conditioning throughout with heating option. Electric underfloor heating. 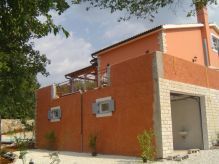 Siamo felici di offrire questa casa ricostruita a con tre camere da letto con i propri bagni, l'aria condizionata e la piscina, nel vilagio di Mofardini. Il villagio ha solamente qualche casa in pietra vendute piu o meno da noi con la carateristica di un buon affito. La casa ha tre camere da letto due di qui con il bagnio ,c'e' il riscaldamento nel pavimento e la cucina compelamente arredata. Tutte le stanze hano la TV SAT e l'accesso Internet. Il pavimento e' in parquet di quercia o in ceramica Italiana. I ristoranti, i cafe bar, i negozi e tutto il necesario si trova a 10 minuti dalla casa, a San Lorenzo. Rovignio si trova a meno di 20 minuti dalla casa dove ci sono dei buoni ristoranti di pecse. Trieste e' a 50 minuti di viaggio e Pola a 25 minuti. Tutti e due hanno la compania Ryanair. Nudimo ovu prelijepu trosobnu klimatiziranu kuću sa bazenom u Mofardinima. Naselje ima svega nekoliko kamenih kuća, većinu od kojih je prodala naša agencija. Profitabilna iznajmljivost. Kuća ima tri spavaće sobe, dvije od kojih sa vlastitim kupatilom. Podno grijanje. Svaka soba ima SAT TV i priključak na Internet. Pod je obložen hrastovim parketom ili talijanskom keramikom. Trgovine, restorani, kafići i sve potrebno se nalazi samo 10 minuta od kuće, u Sv. Lovreču. Rovinj je na manje od 20 minuta vožnje. Na Limskom kanalu možete uživati u prvoklasnom ribljem restoranu. Trst je na 90 minuta vožnje a Pula na 45 minuta. Oba aerodroma sa Ryanair kompanijom. 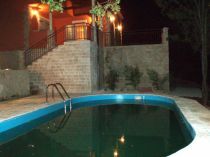 The pool and terrace at night.